Looks like my old Altium account doesn't work anymore, still waiting until someone at Altium verifies my new registration, then I can download the viewer, because the prototype uses Altium Designer. But the schematic shouldn't be too difficult, because it is a simple serial protocol for each chip and they can be chained. But looks like there is not much documentation for the project. Is there any other open source project for this chip? I plan to use Eagle to do my own version. The controller part will be the controller board for my Crazy Cartridge ( http://www.crazycartridge.org ). It has a small FPGA, if the serial communication is timing critical and for the 25 MHz clock generation, and a microcontroller with USB (the SRAM on the board might not be needed). This can be connected to any Linux computer, like a Rasperry Pi, where a miner is running and which has a web interface to setup the miner (IIRC there is already a SD card image for the Raspberry Pi for such a system). Ah screw it, bitcoin's not going to earn you anything whichever way you do it. It's a shame, because if it was worth it, it could've been quite fun. I'd say just try and sell what you've got! Yeah, I don't expect to make a profit. By the time when my hardware is finished, prices might be too low for the old competitor miners to sell my hardware. But could be still a fun project. And I will learn anything, down to the metal with the hashing chips, and all the layers in between, up to the mining software. Unfortunately for you, you are facing the dual hurdles of time lost in design as you've mentioned, and also the costs of local power. With energiewende I don't think your situation will improve in the near future unless you can steal power from your neighbours . I have been looking at bitcoin because the theoretical computer sciencey aspect as well as the social aspect fascinates. One thing that mystifies, why hasn't a semi-manufacturer quietly stepped in with their own chips and started a mining operation themselves. They can afford the development costs and they could locate the installation to someplace cold with fast internet and cheap hydro, like Norway or Quebec. Or maybe one of them is already doing it, in which case all the little miners are in a truly hopeless lost cause. Still no answer so far from Altium regarding my registration, I guess all people are on holiday. But meanwhile I found a link to the viewer. Silly to block it with a login-wall, the viewer is free anyway. The schematic is as simple as expected. The hashunit is one PCB, which needs only four data lines (and the power lines) to control as many Avalon chips as I want. The two control lines are chained for all chips, and the two report lines are all connected together (there are two pullups, so it is an open collector signal). Looks like the power supply with a TPS40193 and some MOSFETs is on another PCB. I'll integrate this all on one PCB. For controlling it, one FPGA should be sufficient, which I then connect to a Raspberry Pi. When powering up the chip it looks like it starts in highest speed configuration, with 2A on the 0.9V supply line. There is a debug clock output for the core clock, which says 10MHz. The datasheet says max clock is 1GHz, so I guess the debug output is divided by 100. I can configure the PLL of the Avalon chip to 625kHz (by judging from the debug output port, for me the datasheet is not very clear and I expected half of it as the core frequency) and then it draws 160mA. This looks linear: when configuring it to 1.25MHz I can measure 300mA. The chip is cold at 160mA, good for testing. Of course, it gets really hot at 2A without a heat sink. The communication interface uses two lines: config_p and config_n. There is an "idle" state, when config_p and config_n are both high. Sending a bit starts by setting both lines to 0, then waiting for 125ns, then setting config_p to high, if you want to send a 1 bit, or setting config_n to high, if you want to send a 0 bit, and then waiting another 125ns. There was no detailed timing description in the datasheet, but looks like there is no timeout, so after this cycle you can wait as long as you want, and then send a 1 or 0 bit again, or go to idle. 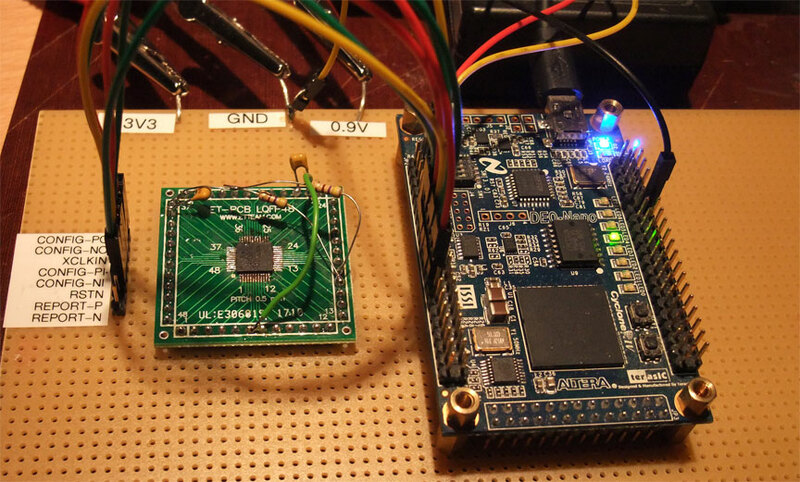 Unlike other serial protocols, this is easy to read on a scope. Chips can be chained. The datasheet didn't explain it in detail (it is still version 0.5, and I guess written in a rush because of the competitors and exponentially rising bitcoin difficulty per day), so I tested it: My FPGA has a receive module for the report_p/report_n lines (I guess the same protocol) and I connected it to the config_p/n chain output instead. When I send 18 words (32 bit per word), all words are forwarded to the output. But when I send more words, one word less is forwarded. The scope shows that it delays one word after the 18th word. This makes sense, because the first words are the same for all chips, and then each chip is initialized with a different nounce start. This first chip uses the last sent nounce, and doesn't forward it, the second chip uses the next to last nounce and so on. Next step will be to create some test data for the chip and let it calculate the nounce for it. The datasheet is not very clear about the data format. There is some pseudo code how to initialize some words, but even the length of the expected data is not documented (but I expect 16 words, because of the 18 words from the chaining experiments, minus two words for the clock config). Awesome work, it'd be great to see it mining Which board are you using to communicate with it? For the final PCB I will replace it with a smaller (and cheaper) Lattice MachXO2 FPGA, and a Raspberry Pi will communicate with it over the serial port instead of a PC. host just for fun. It is running stable for a month with ca. 10MH/s. I found this tread while searching for purchasing the avalon chips to make my own avalon board. system. I cannot program FPGAs but i can build a hardware proffessionally (with altium). Ok, some progress, the chip generates a nonce. But it is not the expected nonce, because I guess something is still wrong with my calculations for the hash initialization, but I wrote an eMail to the support at avalon-asic.com, hopefully they can explain it in more detail. The same nonce is generated each 68.7 seconds, which means it is working at 2^32/68.7=62.5 MH/s. I was wrong in my last posting, the debug clock output was 625 kHz, so the core is 62.5 MHz. Which means the chip can do one hash test in one clock cycle and which allows it to run at 1 GH/s for the maximum allowed frequency. All source code is in the github repository. @GND: Sounds like a good idea. I'm good with FPGAs, but only mediocre with PCB design. Of course, if you have already Altium, you could simply use the project here: http://downloads.canaan-creative.com/hardware/A3255/prototype/ at least for the board with the ASICs. I will try to do it in Eagle anyway, but would be useful if you could review it before I send it to the PCB manufacturer and I can help with the FPGA programming. @mobicek: not bad for low quantities. But if it really takes off, there are cheaper offers for larger quantities. The http://avalon-asics.com shop even claims it is in-stock and they don't do pre-orders anymore (says the FAQ), but would be really expensive, because of the minimum quantity of 2,500 pieces. Pretty sure you don't mean nonce. Moderator removed reference to deleted post. Yes, he does; it has a slightly different meaning in the Bitcoin world than in more general crypto, AFAIK, but it is an established term of art in the latter world. Does rather make a Brit blink at first, though! Hi, I'm also developing system based on A3255-Q48, with 32 chips per board, from scratch schematics, with goal of maximum performance, thus using individual config for each chip (to set max. clock for each chip), and using separate power supply for each chip and Altera FPGA (Cyclone-II) controller in PQFP package, since my experience with BGA soldering quality is not too positive. Using FTDI 245R for USB I/O, and designed for ATX-24 power supply connector, with fan control circuits and temperature sensor included, mini-ITX formfactor. Same as you, I can't figure out the exact data format that goes to the chip - the "midstate" part in particular. Were you able to get further with deducing that data format or some word from Avalon tech support? Now, let me try to sum it up, what's known about that data format at this point. When I send 18 words (32 bit per word), all words are forwarded to the output. But when I send more words, one word less is forwarded. w..w[i-1] <= ? "data" ? w[i+5]..w[j-1] <= ? "midstate" ? so, there they have 20 words! And, supposedly that worked after all, but I'm not quite certain it's the same chip - A3255, seems it's the earlier one. As you can see, there are the midstate words (the getwork-data is in little endian, so the last midstate word 0x3365f562 are encoded as 62f56533 in the midstate array). and testing it for all nNonce, so that the resulting hash has a high number of leading zeros, better than specified in the "target". SHA256 hashes the input in 512 bit chunks = 64 bytes. For the first chunk that would be 4 bytes for the version, 32 bytes for hashPrevBlcok and 28 bytes of hashMerkleRoot. This chunk doesn't change, which is the reason you have to calculate it only once for testing all nNonce values. The SHA256 state for this chunk is called "midstate". The second chunk is filled with zeros, so only 4 bytes of hashMerkleRoot, 4 bytes for nTime and 4 bytes for nBits needs to be transfered. I guess this is the "data" part of the datasheet. Would make sense, because it would fit 3 words length. Now the chip can use the "midstate" of the first chunk to initialize the SHA256 state, and then calculate the hash for the second chunk for all nNonce values. Well, at least that's what I think how it works. I tried any combinations of little/big endian for the data (because bitcoin tends to change this at will at various steps), but no luck. simple or difficult it is to port. I followed this guide for FPGA mining (open source) on DE0-nano and it works. I inserted a correction into this guide to run it with RPi and a mining pool such a BTCguild. Just notice the comment from sparkerdesign (its me) to make it run with RPi. at least size of data is clear now (3 words) and midstate confirmed at 8 words. Since Bitcoin is based on SHA256, could obsolete Bitcoin ASICs be repurposed for other uses like high speed generation of random numbers? Compared to the BFGminer source code, it has some additional #ifdefs for AVALON_A3255, for example for the nonce offset. I wonder if this works, because the datasheet says the offset is 0x180 and not 0xc0. And looks like it doesn't send the A0-A2 and E0-E2 words as mentioned in the datasheet. I wonder how this could work, or maybe the datasheet is wrong? Of course, the miner doesn't send it to directly the ASIC, but it is some USB device in between, maybe this does some more calculations and data conversions. No, because the only output of the ASIC is the nonce, which generates some leading zeros when SHA256 hashed with some more data. You don't get the hashes itself from the chip.